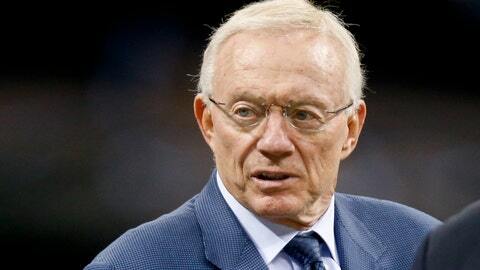 Jerry Jones worried about apathy from Cowboys fans? Jerry Jones is not concerned about the Dallas Cowboys fan base losing interest in the team. Blowing 23-point leads and losing the way they did Sunday against Green Bay, 37-36, is just part of the game today, according to Jones. And to the Cowboys owner and general manager, that makes for good entertainment. Jones was asked Tuesday morning if he worries about apathy from Cowboys fans. "Not with games like the other day," Jones said on 105.3 The Fan [KRLD-FM]. "That’s a show, if you want to look at it that way. That’s not what we’re there to do. We’re there to win the ball game and go forward and win the next ball game. There’s no orchestrating that the other day. I think everyone knows what’s at stake. We spent more money on this ball team than anybody in the NFL did this year. "We let it all hang out. And we should. We’ve got players that I believe if you stack them up around the league, if you talk to different people around the league, we’ve got quality players on this team that can win. Our coaches, Jason [Garrett], over the last 6-7 years, has had experience that you can’t replicate. All of these things can kick in and make us a winning combination. I’ve been here before." But how long will fans be able to hang on if the team doesn’t give them more success on the field? What makes Jones confident they’ll keep coming back? "I’d like to have won another Super Bowl or two over the last 15 years," Jones said. "Our style is to go for it. It really is to go for it. â¦ I do it on a risky basis. We go for it. "Everything is in place, every incentive is here to do everything you can to win a Super Bowl."